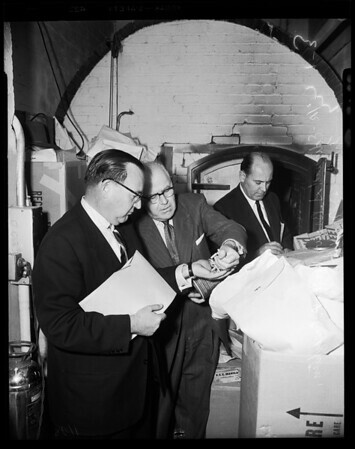 and Chief Walter R. Creighten, State Bureau of Narcotic Enforcement, as they burn some $2,000,000 worth of narcotics in the basement of the State Building as provided in State laws. 13/14: L to R. Superior Judge Harold W. Schweitzer, Attorney General Edmund G. Brown, State Narcotics Chief Walter R. Creighton and Asst. Att. Gen. Frank J. Macklin".